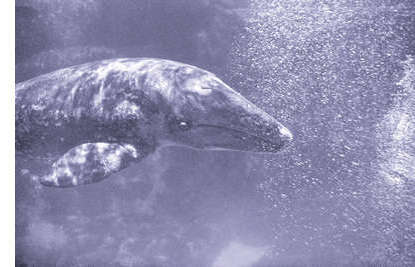 A Gray Whale in Baja's San Ignacio Lagoon in Mexico. Every Fall, gray whales travel 5,000 miles from the frigid waters of the Chukchi and Bering Seas to shelter and breed in the warmth of Baja's San Ignacio Lagoon in Mexico. The United Nations designated this whale sanctuary a World Heritage Site in 1993. In 1994, the Mitsubishi Corporation submitted plans for a joint venture with the Government of Mexico to build the world`s largest salt plant on the shores of San Ignacio Lagoon. Plans included destroying 116 square miles of tidal flats, constructing a 2 km pier for deep water access to offshore tankers, installing 17 loud diesel engines to pump 6,000 gallons of water per second out of the lagoon, and removing mangrove forests. Carlos Baumgarten, head of CEMDA's litigation team, traveled to Eugene to work with ELAW U.S. and get the legal and scientific resources he needed to protect San Ignacio Lagoon. Carlos met with ELAW U.S. Staff Scientists and Attorneys and learned about the dangerous effects of increased salinity on marine animals and U.S. standards for salt production plants. Carlos connected with other scientists and reviewed reports documenting the negative impacts of solar salt facilities around the world. Carlos used this information to support CEMDA`s challenge to the saltworks. For more information about this ELAW Impact contact: Centro Mexicano de Derecho, Ambiental (CEMDA), Atlixco #138, Colonia Condesa, Mexico City, DF 06140, Mexico.